Strange. Wonderful. Delightfully unexpected. These are just some of the words The New York Times book review included in its account of Anjali Sachdeva’s work “All the Names They Used for God.” The Pitt English professor’s short story collection was published in February 2018 and quickly gained acclaim, receiving praise from figures such as Roxane Gay and outlets like Harper’s Bazaar and Entertainment Weekly. Sachdeva grew up in Pittsburgh and is a graduate of Shadyside’s Winchester Thurston School, Yale University and the Iowa Writers’ Workshop. She teaches writing and composition classes at Pitt and is working on creating new classes for the Public and Professional Writing major. Her debut collection contains nine short stories ranging from historical realism to hard science fiction and fantasy. 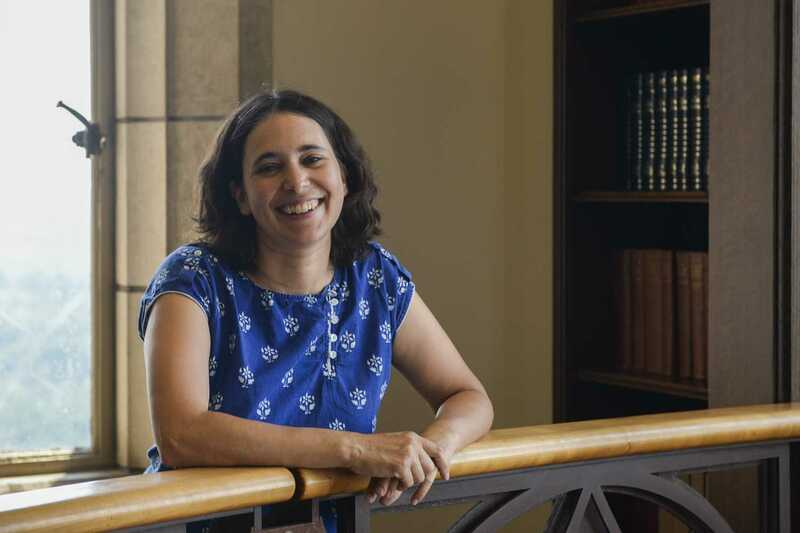 To learn more about “All the Names They Used for God” and the author behind it, The Pitt News’ Victoria Pfefferle-Gillot spoke with Sachdeva about her history and the book’s creation. Pfefferle-Gillot: What was your initial inspiration for the book? Sachdeva: Well, I wrote these stories over a very long period of time, so some of them I wrote when I was in grad school and then the most recent story in the book — I really finished it about a month or so before the manuscript was sold. So to be honest, I didn’t have one particular inspiration because they were over such a long period of time, but a lot of them have some kind of nature element to them because I do like being outdoors a lot, and all of them have some element of magic, or just surreal or supernatural element to them. I love reading science fiction and fantasy, and my writing tends to be not quite science fiction or fantasy but more like realistic settings with magical or supernatural elements to them. Pfefferle-Gillot: So, you said you had many years of writing, what did you do to prepare in terms of research for certain stories? Sachdeva: Some of them the research was just like, actual experiences that I had. So the first story in the book there’s a young woman who’s exploring this big cave system, and I had taken trips to Mammoth Cave National Park in Kentucky and did a 4-hour cave tour. So I was there for a few days and did other sorts of cave exploration and I really love caves and I’ve done a fair amount over the years, so a lot of that is based on my own experience of what it was like to explore caves and some reading that I did about caves, and learned about them. But then other stories I specifically set out to do research, so there’s one story that’s set in Nigeria and the two main characters are two young women who had been kidnapped by Boko Haram and then they have escaped. That one surprised me, honestly, ‘cause I think the other stories in the book, some of them have political elements to them but they’re not directly political or directly tied to current events, but for that one I read just a lot of articles and interviews with and about women who have been kidnapped by Boko Haram and I also read a fair amount about Nigeria, like Nigerian bloggers and things like that just to get a sense of what daily life is like there, because I’ve never been there. And then after I had finished the story I had, I gave it to a young woman from Nigeria and her family– she was born in America but her family’s all from Nigeria, the older generation was born there– and she was kind enough to read it for me and had her family read it for me, just to see, or say if I got anything wrong, or if there was anything to be included here. Pfefferle-Gillot: How did all these stories come together? Were they always set in this order that they were published in, and if not, how did the arrangement change to get set up in this order? Sachdeva: So partly I just thought about, like the first story because it’s about how a young woman enters a magical world, or well not magical, but a kind of unusual world, and so I felt like it was a good way to bring people into the book where you’re following a character who’s kind of leaving the regular world and going into this strange place, and then the last story ends with– I don’t want to give away the ending– but most of the story is this road trip and it’s like the woman reaches the end of the trip, so it seemed like a good ending point. But I am also going to give a lot of credit to my agent who kind of helped me figure out a good organization for the stories in the book. Pfefferle-Gillot: Were there other stories in this collection that didn’t make it into the final product? Sachdeva: Oh yeah! There definitely were a number of stories that I wrote that didn’t make it in here. Mostly I just picked what I felt like were my strongest stories for the collection, but also they did all have some, even though there’s a very wide range of time periods and styles, they all seem tied together in that they all sort of about people wrestling with fate or larger forces in some way so sometimes science or sometimes it’s nature, sometimes it’s religion but I feel like it’s all these people trying to interact with some force that’s bigger than themselves and sometimes it works well for them and sometimes it goes to a darker place. Pfefferle-Gillot: What kind of story did you enjoy writing more, something more like the opening story “The World by Night” or “Logging Lake,” or more like“John Greenman and the Mermaid”? Sachdeva: Oh, you know I don’t think there were any. I think I enjoyed writing all of the stories in there, but I do sort of enjoy the research part of it, like when I wrote “The World by Night” I looked up information about pioneers but then I was also looking at, the main character has albinism, so I looked at like what was life like for people with that condition in the 1800s ‘cause I was curious and that was interesting to me to kind of learn about, um that aspect of it. I think sometimes that aspect of it is fun for me where like “Robert Greenman and the Mermaid” I did learn stuff about fishing because the main character’s a commercial fisherman, but most of it was from my imagination, and it’s not that I don’t like writing those kinds of stories, but I do find it more difficult. Pfefferle-Gillot: Were there any stories you wanted to stay in longer, to write a longer-form piece? Sachdeva: You know, it’s interesting, I think one of the things I like about short stories is that I can explore one particular idea really intensely. And so usually by the time I reach the end of the story, I’m actually ready to move on to something else. I think that if there was one I would pick that I would go back to, it would be “Manus”– the one with aliens cutting off people’s hands off– just because you could probably say more about what would happen in that world. But really I like the short story form for that reason, and that’s why I liked this book because I got to explore so many realities and so many sets of characters. Pfefferle-Gillot: Which was the easiest part of the book to write and the hardest part? Sachdeva: I think that last story, “Pleiades” it was one of those stories that just, as soon as I started writing it I knew it was gonna be a story that I really loved by the time it was done. That being said, it changed a lot. I mean, right now it has two different first person narrators and in the first draft it had a third narrator and the ending was very different, so it’s not as if it didn’t change. I mean, I’m really big on revision, I always do a lot of drafts, and I’m not, I don’t hesitate to make big changes and things from draft to draft. But I think even from the beginning, I just was excited about the idea behind that story. Pfefferle-Gillot: There were plenty of times I was caught off guard by the deep-cut themes and emotions of each story, two of the big ones were “Glass-Lung” and “All the Names For God,” those were huge standouts. I was very surprised with how deep they got, so were there any moments when you were writing them, any of them, when you really felt overwhelmed by what you were drawing out? Sachdeva: Yeah, “All the Names for God” was definitely one of the harder ones to write. So that one just because the experiences of those characters go through are so terrible. That one was definitely difficult. You know partly I was worried about writing it, like is this a story I have the right to tell, and am I accurately portraying what these women’s lives would be like, and all those kinds of writerly anxieties, but also on behalf of the characters, they have some difficult experiences, so that was difficult to write, and also when I did send what I thought was the final drafts out to my agent, she said so much of– there’s a scene where the girls have been kidnapped and they’re in this camp and these government soldiers come looking for them to try and rescue them and there’s this big shootout between the kidnappers and the government, and it’s a really violent scene. That wasn’t initially in there, but my agent had read the story and said there’s so much implied violence in this story, so much of it is about how these girls have been changed by the violence they lived through but we never see that violence. And she was like, I’m not saying there needs to be gruesome or it needs to be a violent story overall but she said I think it doesn’t make sense to avoid talking about that in a story that implicitly already so much is about violence. And so I went back and wrote that scene. So that was a difficult scene to write. Pfefferle-Gillot: This is your first book, and it’s become very successful. Are you working on another, and is it also a short story compilation, or a novel, or are you just taking a break right now? Sachdeva: No, I’m working on a novel right now. I am working on a novel now, but in the very early stages, so I’m not discussing it too much in terms of what it’s about just because it’s just really hard to focus on the writing and not overthink things and so I think it’s helpful to me to not give out a bunch of details about it. But this book I finished writing, or I think I gave the finished version of it to my agent about ten days before my younger daughter was born, so I did not get much writing done in this year after that. So this summer is the first time I’ve really gotten back to writing as much as I usually would. And also during the year after the book was sold there’s always a lot of work to do in terms of doing final edits and doing interviews and promotional things, so that took up all of my writing time, but this summer I’ve been working very hard on this novel, and what I’ll be doing for the foreseeable future. Pfefferle-Gillot: What are the challenges, currently, and during All the Names They Used for God, of the writing process compared to and alongside your teaching at Pitt? Sachdeva: I think the biggest challenge is just trying to find enough time because I do teach full-time, I have two small kids, and you know, somebody needs to cook dinner and clean clothes once in a while, so there’s a lot of stuff going on, so I really do try to just make the most of the time that I have. I’m in two writing groups which is really great because it really keeps me on schedule and it’s very inspirational and the people in the group are very supportive and give me a lot of good feedback, so that’s very helpful. So part of it’s that, one of the main challenges when I was writing the short story collection was just to keep going. You know, of the people I went to graduate school with, a lot of them published books right away after we finished school and have been very successful. So partly, it just took a longer time to finish the book and to publish it, and I think for a lot of writers it’s difficult to just stick with it and not give up when it takes a really long time to get something published, but beyond that, especially with this new book the challenge is just to not to try to think too much about “are people gonna like this?” “Am I gonna be able to sell it to a publisher?” “Will I sell enough copies after it gets published?”, not to focus so much on the practical part of it and just focus on the creative aspect of it. Pfefferle-Gillot: Right, so you already answered the next question I was going to ask. What other kinds of tips or words of wisdom can you give to the young student writers here at Pitt? Sachdeva: I think the most important thing I would tell to the student writers is, number one: it is important to finish your pieces. I think when I was starting out, I wrote a lot of half stories because I would get bored of something partway through and I would just move on to the next thing but you definitely learn things by completing the story, novel, whatever you’re working on that you don’t learn. I mean you can still learn writing skills by writing half a story, you can learn characterization and description, all kinds of important things, but you do learn things about structure and narrative every time you finish something that you don’t learn by not completing things. So I do think it’s important to finish things, and I think it’s important especially for younger writers to not fixate on trying to have a particular genre, style, or trying to fit some particular mold, and really just write about the things that are interesting to you, are exciting to you, and not worry so much about whether they fit into genres or are they publishable, or whatever. I don’t think that really matters at this point. And you don’t know, you never know what’s gonna be popular five years from now and it’s not really worth thinking about, I think. It’s a good recipe to make yourself miserable to try and guess what people want to read and it’s much more important to focus on what you want to write.